Do DUI Checkpoints Target Minorities? 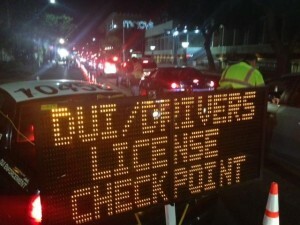 Police officers insist that it’s a matter of public safety when they’re setting up checkpoints for DUI in Los Angeles, New York, Miami or any other city. But do all motorists get treated the same when it comes to screening for excessive alcohol consumption? A report in the Chicago Tribune says that the Chicago Police Department sets up DUI checkpoints almost exclusively in African American and Latino sections of the city. Police stopped motorists at 14 such sites between March and September 2015; nine were in police districts serving a majority black population, four in Latino areas and only one in a majority white district. The paper cites examples of this disparity, noting the Grand Crossing District, which is mostly black, had the fewest alcohol-related accidents in the city while the predominantly white Jefferson Park District has the third highest number of such crashes. But authorities skipped Jefferson Park for a DUI checkpoint and scheduled one for Grand Crossing. A spokesman for the Chicago Police Department said that police use crash and citation data to choose the DUI checkpoint locations and that their goal is to safeguard the people of Chicago. But when the Tribune analyzed police data earlier this year it found no clear indication of correlation between a high number of DUI checkpoints and fewer alcohol-related crashes. But the data did show that during the last five years police set up 84 percent of 152 sobriety checkpoints in minority neighborhoods. The chair of Chicago City Council’s Black Caucus has called for hearings on how police select the sobriety checkpoint locations. Meanwhile, people who don’t want to go through any DUI checkpoints at all can play it safe by driving only in Alaska, Idaho, Michigan, Montana, Rhode Island, Texas, Washington, Wisconsin or Wyoming. Those nine states have all banned DUI checkpoints.